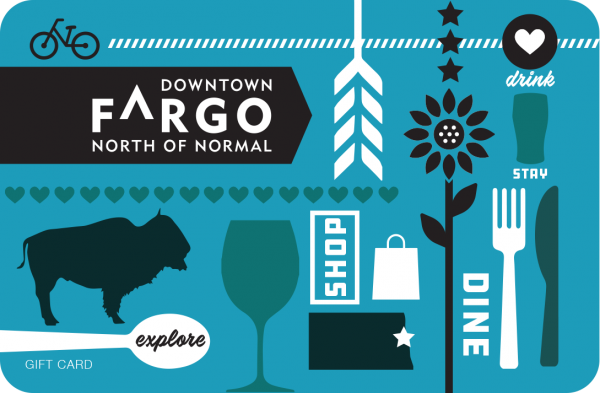 Where Gift Cards Are Accepted: Over 65 businesses accept the Downtown Fargo Gift Card! See below for the list of locations downtown accepting gift cards! This fee includes shipping, handling, and activation of the gift card. There is a $4 flat rate for all Downtown Fargo gift cards. (1) Happy Holidays stamp, (2) Love Birds stamp, (3) To: From: stamp, (4) XOXO stamp, (5) Thank You stamp. View the terms and conditions of the Cardholder Agreement. Gift cards can also be purchased at the Radisson Hotel and Fargo-Moorhead Visitor’s Center.